This is a Mocha Cake, or more accurately Coffee Flavour Cake with Chocolate Frosting. I couldn’t really call it a coffee cake, as that is something which you have with coffee and doesn’t taste of coffee strangely. This is also a bit of a ‘Wake Cake’ sadly. As you may know, if reading my blog recently, we had cousin Lawrence from Toronto staying with us for a few days. His mother, who was Disneyboi’s aunt, passed away at the end of 2015. Lawrence felt it would be nice to have a little memorial for Auntie Rena whilst he was over, so the Scottish contingent of the family could pay their respects to her. We held the gathering in our house, on Sunday afternoon, when all of the family could make it. And we had a little spread laid on as well, kindly provided by Lawrence. However, I wanted to make a cake for the family to have when they were here too. So I decided to come up with this coffee infused layer cake, surrounded by a coating of fudgy chocolate frosting. The cake is simple to make, but looks and tastes very impressive. I grated on white chocolate for a bit of decoration, but I think that it’s the inside of the cake which is most appealing. I baked two layers, but cut each layer in half, making a four layer cake. I know not everyone is a fan of coffee flavoured food but it is subtle and really enhances the fudgylush (new word) frosting. I for one am a huge fan of coffee flavour food and I would have added more, but as we were entertaining I wanted everyone to enjoy it. Even those who tried the cake and don’t like the old java were pleasantly satisfied after trying this. If you love Starbucks then you will love this Mocha Cake! The frosting is adapted from a recipe by good old Martha Stewart. Grease and line two 8” baking tins. Pre-heat the oven to 180C (160C fan).Sift together the flour, salt and baking powder in a bowl and set aside.Dissolve the coffee powder in the boiling water and set aside.In a food mixer, beat together 110 grams of the butter and the granulated sugar until and pale a fluffy.Add the eggs one at a time, mixing in between. Add the 1 teaspoon of the vanilla and stir through.Add one third of the flour and mix through. Add 80 ml of the milk and stir through.Add another third of the flour and mix through then add the dissolved coffee and stir through.Lastly, add the remaining flour and stir through.Divide the mix equally between the two cake tins and bake for 20 to 25 minutes or until a toothpick comes out clean from the centre.Allow the cakes cool fully and preferably overnight.When the cakes have cooled set about making the frosting.Sift the icing sugar and cocoa powder into the bowl of a food mixer and add two teaspoons vanilla, 180 grams butter and 120 ml milk. Beat on high until smooth and creamy.Cut each layer of cake in half two have four discs of cake.Frost each layer, laying on top of one another and then around the sides until coated. Leave some, whilst you chill for an hour.Give a final coating off frosting and decorate with white chocolate if desired.Enjoy! I'm entering this cake into this month's Love Cake hosted by Ness at Jibber Jabber UK - the theme is 'I'll Drink To That', so this coffee infused cake is perfect! It's a wakey-wake-cake! I've never used espresso powder at all... I might get some! It's a great addition to the kitchen cupboard, although I probably wouldn't use it to make a cup of coffee strangely! I've become a big fan of instant espresso powder in baking.... so much more intense in flavour! Never thought of it as Scottish Kate, but I like that! Sorry to hear your sad news. This does sound the perfect comforting cake for the occasion. 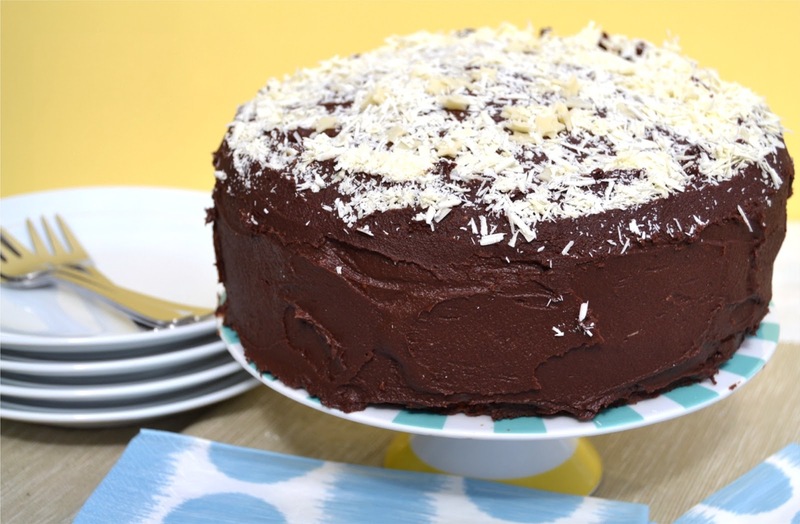 I love the idea of a mocha cake! Great to go with a cup of mocha!! I am sorry to hear of your loss I think parties in remembrance of someone is a great idea!! Thanks Lisa, everyone seemed to love it! I think you might have just made my husband's ideal food. Not just ideal cake, but ideal food. I might make it for him as a surprise this weekend. Hope he enjoyed it Dannii! Sounds fudgylush indeed! So great to have it with espresso powder - yum! You are so right Jeanne - madness!! My husband saw this on Twitter when I retweeted it and said, "That looks good!". I knew this would happen! Just got to think of a suitable occasion to make it now.